Email spoofing is a big security issue in IT. Often email users get fake emails pretending to be from colleagues or from their boss, and many of them fall for it sometimes leaking sensitive information to spammers. Why is email spoofing possible? What is the easiest way to identify a spoofed email? As an IT person how can I block spoofed emails? How do I implement those records? Email spoofing is the process of forging an email address to make it look like is sent from a known email address. Basically in a spoofed email the from: field is modified to make it look like the email is coming from a person the recipient know.The result is that the email recipient sees the email as having come from the address in the From: field; but if they reply to the email it will go to Reply-to email address which is an email address the spammer might have setup to receive those replies. The reason why email spoofing is possible and relatively easy for spammers to do is because of a vulnerability in the protocol used to transport emails through the Internet. SMTP (Simple Mail Transport Protocol) does not use any authentication mechanism for header fields like from, Reply-to, Return-Path spammers forge these headers using certain commands to make it appear that is coming from a different source than its original one. Spammers spoof emails for many different reasons but the most common reason is to obtain valuable and sensitive information like SSNs, credit cards, bank accounts, etc. The easiest way to identify a spoofed email is by examining the characteristics within the email very closely. A spoofed email will rarely address the recipient directly, and will use terms like “Hi, Hello, Good morning or formal terms like Sir or Madam, or no addressing at all. Unless the person is being targeted directly, spammers send those emails in a batch, so no one is addressed individually. Also you can identify a spoofed email by looking at the “Internet header” there you should be able to see the original source o of the email. if after checking all that you are still unconvinced that the email is fake, then call the sender on the phone and ask if she/he really sent the email. Don’t ever reply to the email if you are unsure. DKIM (Domain Keys Identify Mail ) as SPF DKIM is intended to prevent forged sender addresses in emails. DKIM allows the receiver to check that an email claimed to come from a specific domain was indeed authorized by the owner of that domain which is done using cryptographic authentication. DMARC (Domain-based Message Authentication, Reporting and Conformance) DMARC is an email validation system designed to detect and prevent email spoofing. It provides a mechanism which allows a receiving organization to check that incoming mail from a domain is authorized by that domain’s administrators and that the email (including attachments) has not been modified during transport. It is thus intended to combat certain techniques often used in spoofed emails, such as emails with forged sender addresses that appear to originate from legitimate organizations. One important detail to keep in mind is that DMARC is built on top of the first two mechanisms, SPF and DKIM, so those two need to be implemented before implementing the DMARC record. Are there third party hosts that need to be white listed that you are not aware of? external newsletters and other cloud hosted applications? ittutorials.net. 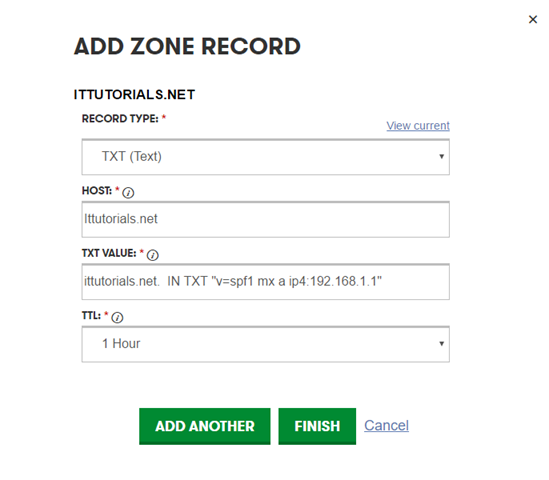 IN TXT "v=spf1 mx a ip4:192.168.1.1"
After you add the record, go to a website like this http://mxtoolbox.com/spf.aspx to check if the record is valid. Blocking spoofed emails is not easy because of the SMTP protocol vulnerabilities, but by implementing the authentication mechanisms I wrote in this tutorial you can almost eliminate spoofed emails completely. I hope this tutorial gave you some insights on how to combat spoofed emails. If you have any question, suggestion or comment, please let me know in the comments. Thanks.